The amount of flavor in meat is determined to a large extent upon the amount of work that muscle had to do, and so shanks are very flavorful. Unfortunately muscles that do a lot of work also become tough, so there is often a choice between tender meat with a light flavor (such as tenderloin) or tough with meat lots of flavor (such as shanks). With traditional preparation, tough meat is often braised or stewed which makes it tender and flaky. The drawback of braising is that braised meat is often a bit dry. With sous-vide, you can have the best of both worlds: tough cuts can be cooked at a temperature that is just high enough to break down the toughness, but also low enough to allow the meat to stay succulent. The meat will be fork tender, succulent, and very flavorful. The only drawback of the low temperature is that it takes a long time, between 24 and 72 hours. It is not a big problem because sous-vide cooking does not require any attention at all while it’s going on. So you can start up the cooking process on Sunday afternoon and serve outstanding meat on Tuesday night. Lamb has a lot of flavor that is sometimes characterized as ‘gamey’. 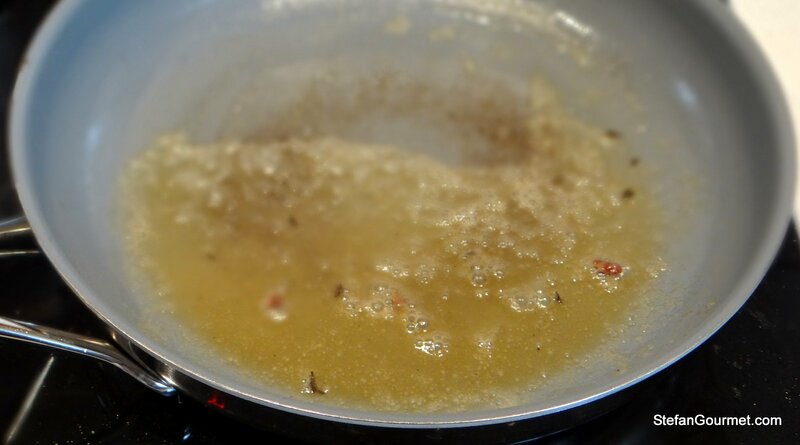 When cooked for such a long time, the gamey flavor is accentuated and can become too strong. There are two ways to work around this: (1) use only meat from ewes (female lamb) rather than rams (male lamb), because the males have a much stronger scent, and (2) cook the meat with a bit of thyme and a bit of olive oil. case, I served the lamb simply with a bit of its own jus. 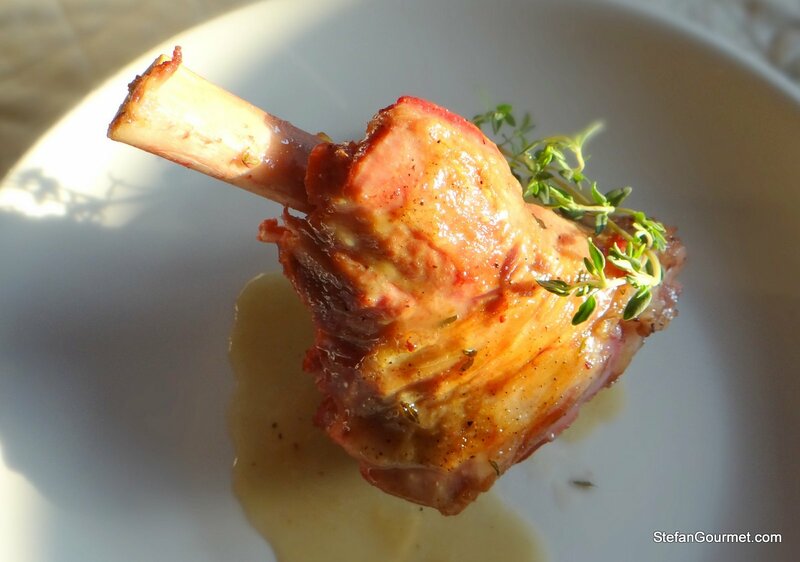 More elaborate recipes for lamb shank sous-vide can be found here (Italian) and here (with yogurt and chiles). 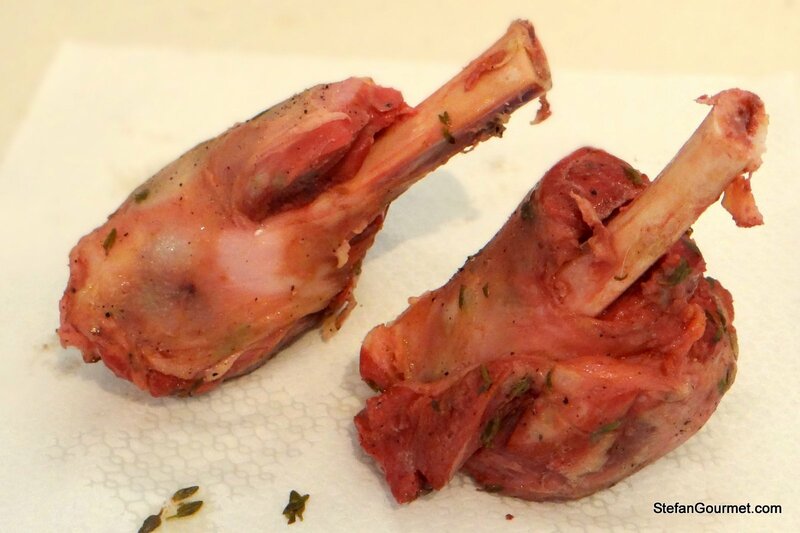 Wash the lamb shanks with cold water and pat them dry with paper towels. Rub the lamb shanks with extra virgin olive oil, salt, and freshly ground black pepper on all sides. 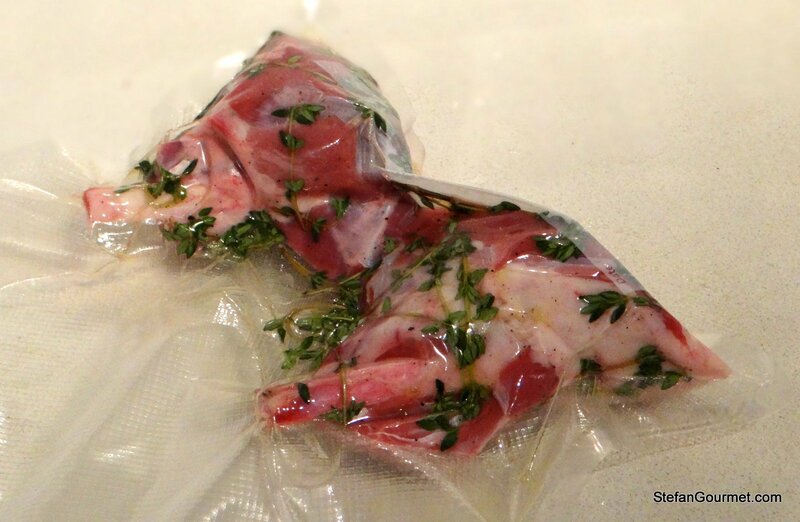 Vacuum seal with fresh thyme. Cook sous-vide for about 2 days at 62C/144F. 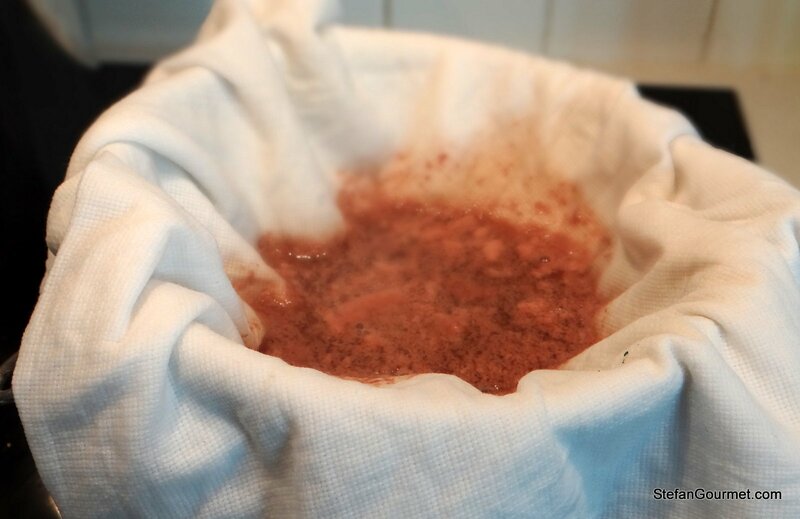 Transfer the juices from the pouch to a saucepan. Bring to a boil and then lower the heat. Scum will form as the proteins in the juices have only been heated to 62C/144F during the sous-vide cooking and some of them will coagulate. Filter out the scum with a cheese cloth or paper towels, reserving the clear juices and discarding the scum. Pat the lamb shanks dry with paper towels. 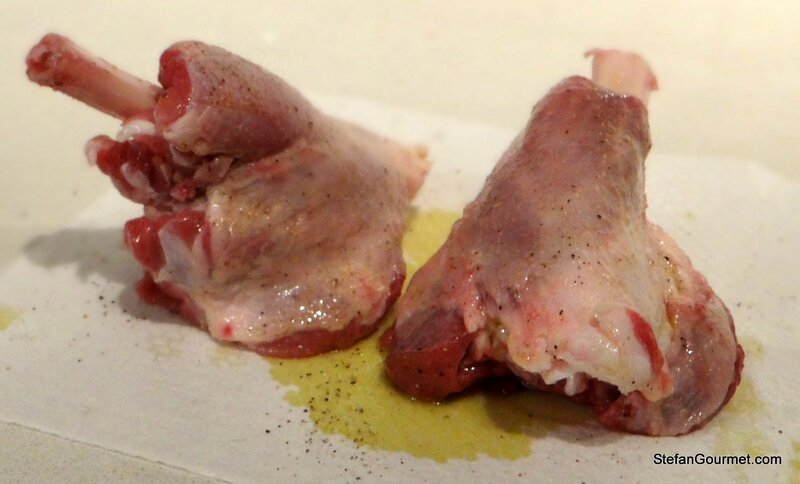 Brown the lamb shanks quickly in very hot clarified butter or olive oil. 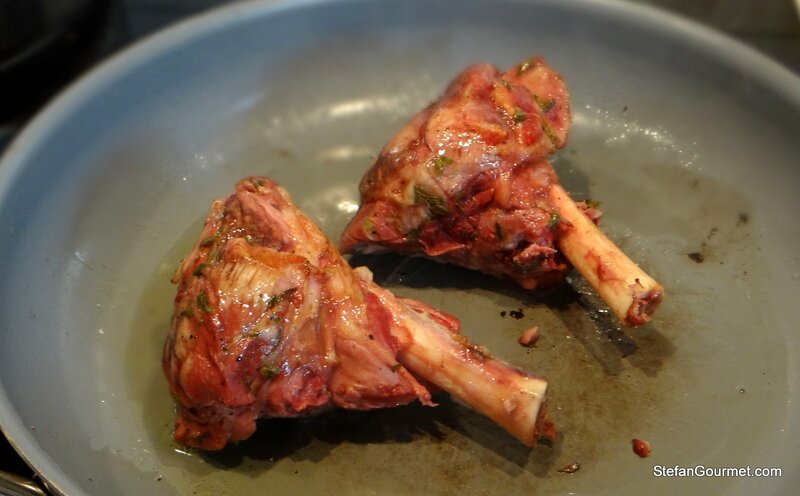 Put the lamb shanks on warm plates and deglaze the pan with the lamb juices obtained from the bag, using a wooden spatula to scrape any browned bits off the bottom of the pan. 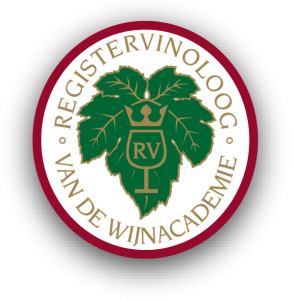 If you will be serving wine with the lamb, it’s also nice to add a bit of the same wine at this point. Allow the lamb juices (and the wine, if using) to reduce briefly over medium heat. Serve the lamb shanks on warm plates with the jus. Stefan, Do you have any tips for people without a the sous-vide technology? This recepy looks great! 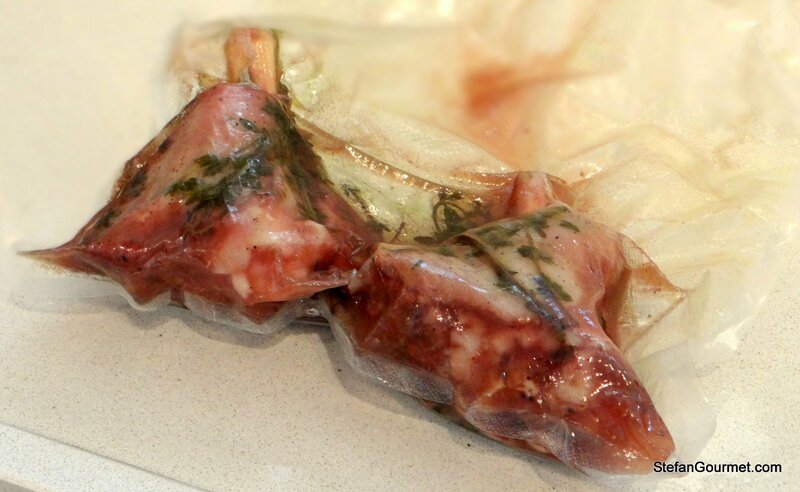 To prepare lamb shanks without sous-vide you can try wrapping them in aluminum foil (with olive oil, thyme, salt and pepper; you could also add rosemary, garlic, butter) and baking them for 2.5 hours at 200C/400F. 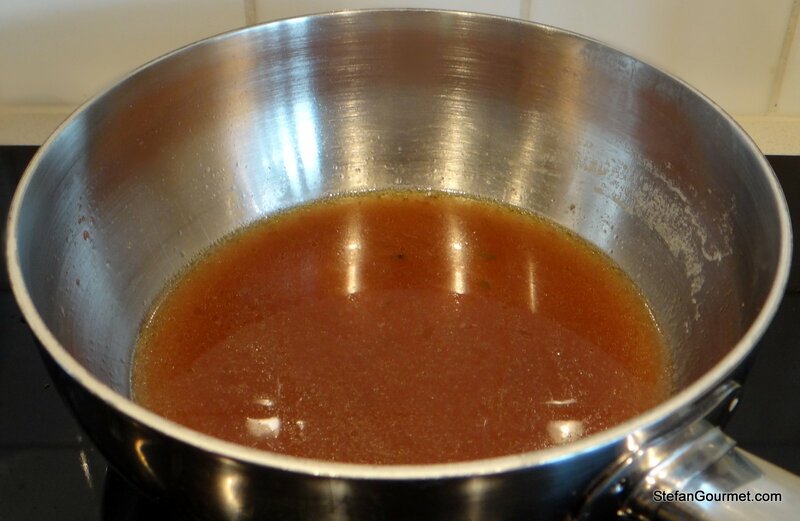 Wrap them such that the juices will gather in the bottom of each parcel, and then make a jus from those juices and brown the shanks at the end by putting them back into the oven after removing the aluminum foil while you are making the jus. I’ve had pretty good results this way before I had sous-vide. Great! You can definitely add garlic and/or other herbs such as rosemary. Making such a pocket is especially important when baking/roasting the lamb shanks. The ‘gaminess’ depends mostly on the age of the lamb. Lamb should ideally be 4 months old or so; if it becomes too old it will really be a young sheep rather than a lamb. 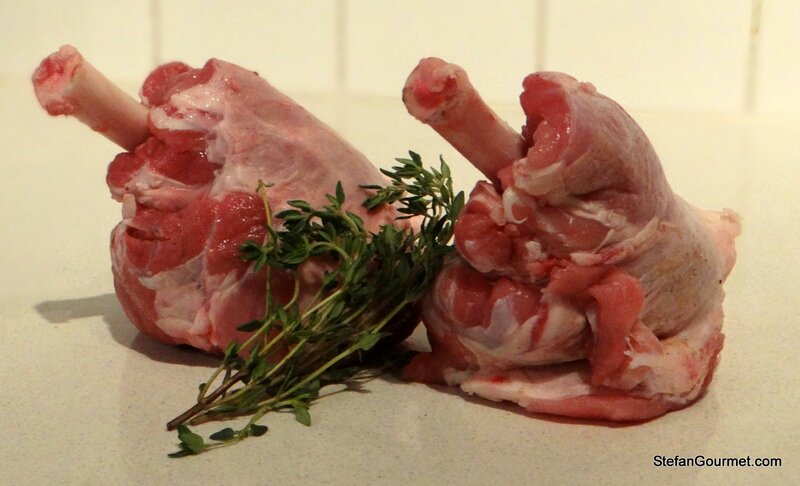 I’ve never seen such vibrantly colored lamb shanks before… very attractive! I like the idea of serving veggie and meat as separate ‘piatti’ and I am very interested in trying lamb shanks slow cooked in foil at low temperature. Thanks 🙂 Would certainly be nice to try that — I know they can be cooked in foil in the oven in 2-3 hours at 200C/400F, but it should also be possible to go lower and slower. I like this a lot Stefan. The shanks look really good. I also like the idea of putting them on to cook two days before serving. OK, Stefan. You have convinced me. I have 1 very lonely lamb shank waiting for me. I will pull it out of the freezer and sous vide it this week. This looks divine. The lonely lamb shank is now thawed and will start the sous vide process in a couple of hours. 🙂 I’ll let you know how it turns out. ah! love lamb shanks, never made them sous vide though! really like the simplicity here…. of course, there’s the 48 hour cooking time, but I’m sure the result is phenomenal, is on my to do list! The gaminess of this or other cuts of meat is something I have never had much trouble with, I’m lucky I guess 🙂 thanks for posting, looks great! 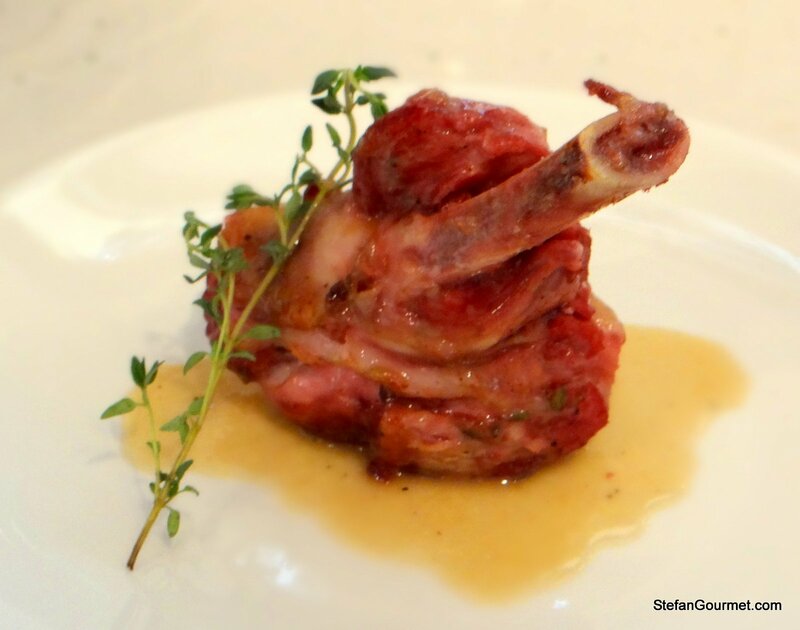 I love lamb shank, and it can’t be prepared any better than this. Bravo Stefan! I’ve never seen a fully cooked lamb shank that color, Stefan, and it sure does look moist. Like I’ve said, you sure do know how to sue that sous-vide equipment. The range of dishes you’ve shared is remarkable! Thanks for sharing your experience with us. Well said, Stefan. Keep up the amazing work ou do in the kitchen! WOW I really enjoy your sous vide recipes. Food cooked in a sous vide is exceptional! Thanks Jerry! Do you cook sous vide yourself? Yes I cook with a poly science sous vide at home and truly appreciate your recipt. The smoked brisket is always a winner here in Texas! Great to hear! If you have any ideas of how to use sous-vide that you haven’t seen on my blog, please let me know. How freezing the shanks in the vac-pack after cooking? Hi Bill, you could certainly do that. It is important to chill the vac-pack in ice water after cooking sous-vide, and then freeze it as soon as possible. To reheat, simply put the frozen vac-pack in the sous-vide cooker for 3-4 hours at 60C/140F. Made this for dinner and had it tonight. It was absolutely delicious! That’s great to hear, thanks so much for letting me know! How long have you been cooking sous-vide? What is your favorite dish? I only started about a month ago. So far I think this one came out the best. I like to sous vide chicken breast as it comes out very juicy. I’m sure I will be checking your blog again for tips. Thanks very much for sharing your recipes with us! I tried the shanks tonight (of course they cooked 48 hours as per the recipe). Truly amazing!!!! I love lamb shanks and before discovering sous vide cooking I either braised them or pressure cooked them. While those methods are wonderful too I would have to say that this method does truly out do them! The jus was incredibly delicious as well. I wish I had remembered cheesecloth when I went shopping but it still was amazing. And thanks for the tip about using the same wine in the jus as was being served. The whole hing was a definite winner with my family!!! Thanks so much! I just bought an Anova One sous vide, a less expensive and less voluminous alternative. The first recipe I tried was the Lamb Shank. WOW! what a great experience. Thank you Stefan for your inspiration. Hi Hein, that is so great to hear! I’m glad your lamb shanks turned out so well. I recently made the mistake of buying lamb shanks from a halal butcher rather than my regular butcher, and in retrospect it must have been sheep (mutton) instead of lamb as it was tough and tasteless. I’m so glad your first experience was not like that 😉 I hope to see you here again soon and please don’t hesitate with any questions about sous-vide, as I would be happy to answer them. Thank you for the recipe. I made it this weekend and the results were good. I purchased 2 basic shanks (as opposed to something more gourmet like grass fed, organic, etc. etc.) from the grocery store. I cooked it sous vide for 48 hours with rosemary since I didn’t have any thyme at home. I found the lamb very gamey. When I took it out from the plastic bag, it really stank and I was very skeptical of the final product. The juice from the bag was the same, but the sauce I made with it with red wine was fine. The lamb was tasty and properly cooked for sure, but the smell wasn’t appetizing. The whole house smelled strongly of lamb after I had seared it. What do you think happened? Should I have used thyme instead of rosemary? Or do you think the lamb just happened to not be fresh? Are there any specific cuts of lamb that are more gamey than others? I know, too many questions :), but so far I have only braised lamb and that too with Indian spices which can take care of even the strongest of smells :). Thanks for your blog. It is very nice. Thank you for the information. Glad to know that your experience was different. I will try it again and let you know how it goes. Besides, there are too many other recipes on your blog that I need to get to first. This recipe is so simple and produces such excellent results that it is my standard way of preparing lamb shanks now. I have also tried both the yogurt and asparagus variations and both are good but involve rather more preparation time. Being able to take two supermarket shanks and have them in the sous vide in less than 5 minutes is great. I vary the herbs, add some additional seasonings – but the 48 hours at 62 is sacrosanct! The texture is a little different to slow braised shanks – but we like it better. It is also easy to separate it from the bone after cooking. There is a recipe here where that is done first but one can easily cheat and do it afterwards with a little care. Thanks, Himeros! This is also my favorite cut of lamb sous-vide. Separating the bone after cooking is indeed a lot easier. I separated first to make stock, but if you make them regularly you could of course remove the bone after cooking to be used for stock next time. Stephan thanks for your inspiring sous vide features. I just prepared venison shanks for my anova model–the meat came from my hunting friends who enjoy challenging me with wild game. I did not use the raw herbs as the last time I included fresh herbs/veg my cooking bags got all puffy and smelly. Possibly from wild bacteria I never thot until you mentioned. Anyway I took a page from my brewing book and used a weak iodine solution to clean the meat surface and then rinsed off well. Cheers and Salud!